Going to Louisiana for the first time, I didn’t have many expectations. Being from New England, I generalize all southern states into The South with little differentiation between the borderlines. But I was poorly mistaken and pleasantly surprised by my first visit to the Pelican State. With its low-country flavors and foreign drawl, Louisiana deserves to be its own country. 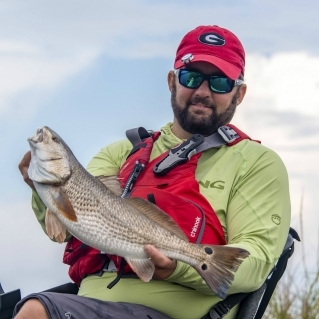 The NRS Fishing team introduced me to Pointe Aux Chenes, where we set up camp and spent five days on the hunt for big reds, exploring the culture of Lafayette and paddling with alligators as we tried to hook-up a Largemouth bass on Lake Martin. 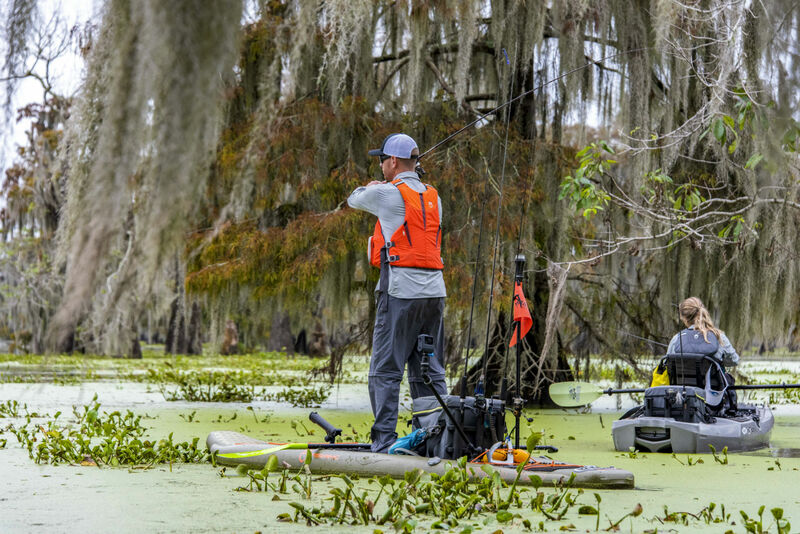 Between fishing with gators and paddling between Spanish moss draperies, eating food that set my mouth on fire and battling the stench of sulfur, the entire week shocked all of my senses. We spent most of our time in Pointe Aux Chenes. To say the locals treated us like family would be an understatement—southern hospitality is no joke—especially at PAC Kayak Rentals. 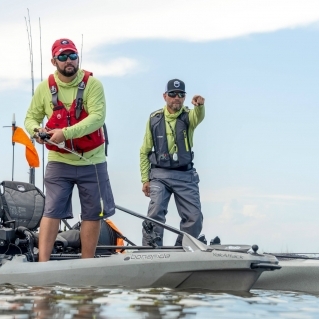 For those who live for kayak fishing (and literally bring the kitchen sink with them on trips), PAC offers full RV hookups. For others who’d rather fly-in but still have a kitchen sink, PAC also rents RVs. There’s a kayak launch and boat ramp on site. 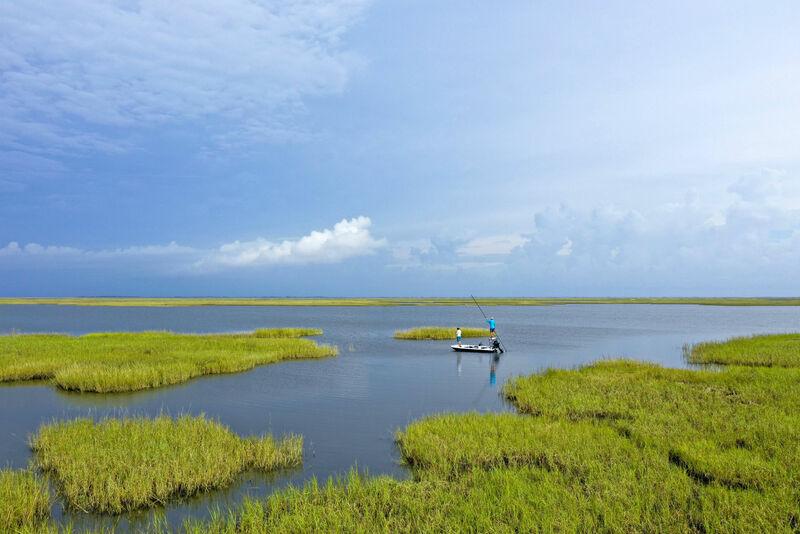 The knowledgeable staff at PAC will set you up with the right kayak for stalking the nooks and crannies of the marsh but I recommend bringing your own—and I mean all of them—fishing rods. 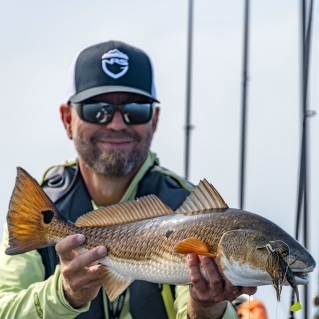 Between the redfish, black drum and speckled trout, the fishing just beyond the PAC marina is incredible (not to mention if you venture past LaFayette and on to Lake Martin). 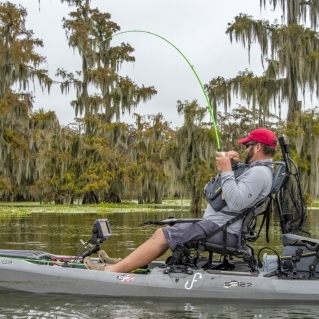 Light baitcast reels and spinning rods are perfect for a day in the bayou. 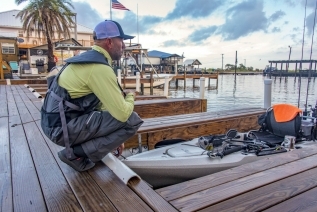 I can almost guarantee you’ll catch something if you have the right gear and skill set. Don’t forget the camera. Between the wildlife and the unique scenery—have I mentioned the Spanish moss?—photo opportunities are endless. The best part, at the end of the day, PAC Shack, located beside the marina, will season and grill your catch for less than seven bucks. But be prepared to spend more. (You can’t skimp on the sides.) The staff recommended I order the hush puppies and described them as “fried dough.” If you’re from the north, fried cornbread with PAC special sauce is nothing like the fried dough sprinkled with powdered sugar of my childhood. Chunks of sweet corn oozed out from the crispy, golden cornmeal and sent my taste buds to places they’ve never been before. In fact, if you only bring a few things to Louisiana, I highly recommend an appetite be one of them. I’d go as far as advising you starve yourself for about three days in advance just so you can experience all of the Cajun food and seafood Point Aux Chenes and Lafayette have to offer. Between the jambalaya and gumbo, étouffée and po’boys, dieting in Louisiana is a poor choice. Seafood options overrun the menu, especially in Point Aux Chenes. 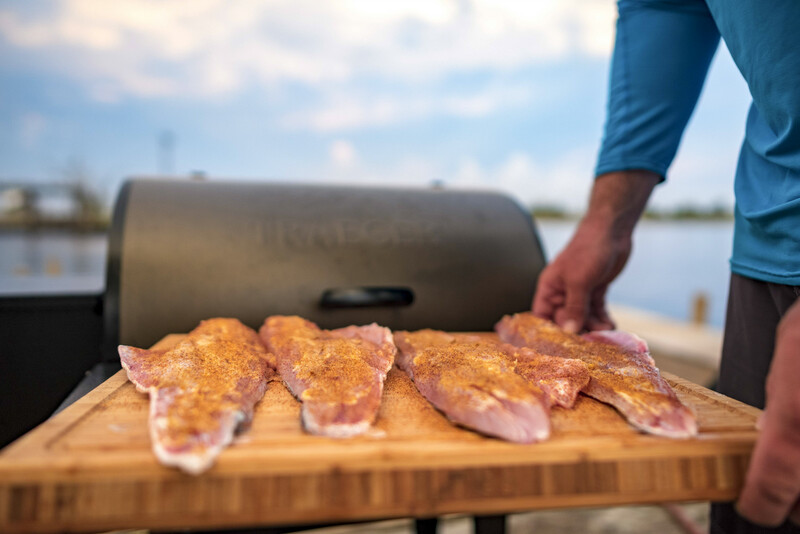 Redfish, a delicacy that some may consider the best white meat seafood they’ve ever had, are caught daily in the marsh and brought back to shore. Along with blue crab and spotted sea trout (speckled trout). Cajun food comes with a lot of spice. Even when you think you’re playing it safe, spicy flavors trickle into other dishes you wouldn’t expect to have heat in them. You’ve been warned. 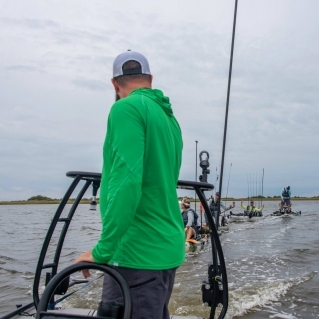 On top of the spice, anglers planning a trip to Point Aux Chenes should also heed the weather forecast warnings or lack thereof. 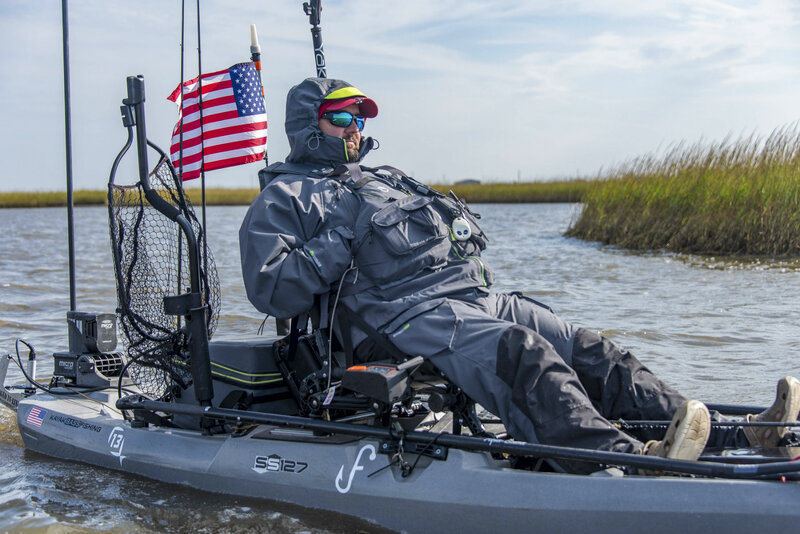 Maybe it’s just a Louisiana thing or the Gulf of Mexico in general, but the abrupt and unpredictable weather patterns are not to be messed with. We spent as much time chasing fish as mid-afternoon storms spent chasing us. You could almost predict the time of day by the low rumble of thunder. The mixture of the heat and the humidity creates the perfect atmosphere for some severe wind and thunderstorms. If it’s showing up on the radar, you know you’re in for something crazy. We woke up plenty of nights to the trailer creaking and swaying as sideways-rain pelted the RV. But, just because it rains during the night doesn’t mean it won’t be 80 and sunny during the day. In other words, layer up and don’t forget your rain gear. The team basically lived in the NRS Guide Shirts, Varial Hoodies and Baja Sun shirts. You need sun protection year-around in the low country. But the Sidewinder Bibs and Champion Jacket made multiple appearances when the storm clouds rolled in. 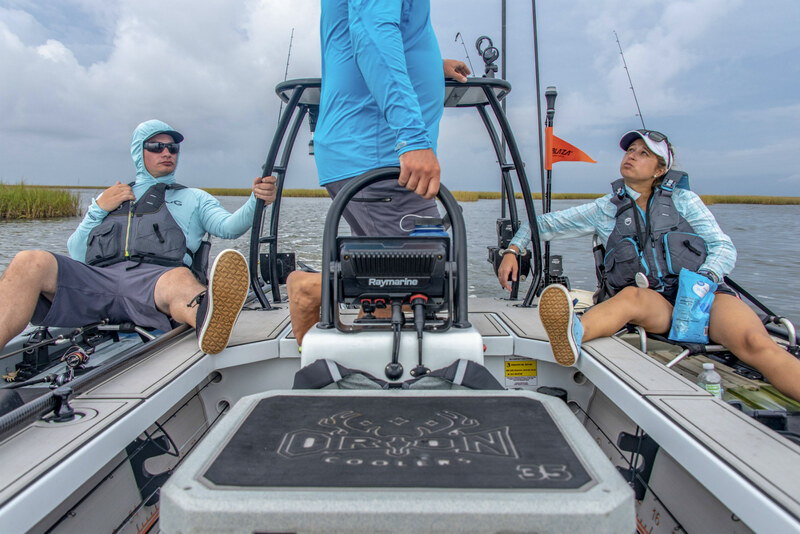 If you didn’t get enough of the daytime marsh fishing, throw on a hoodie and head down to the dock for a little—or a lot of—night fishing on light tackle. You’re guaranteed to catch fish and might even knock off three different species in one night. Trout chase shrimp on topwater and bite all night long. You could throw a single circle hook into the water and they’ll take it right off the dock. Minutes turn into hours and before you know it, it’s 1 a.m. and you’ve caught 50 trout and the occasional red fish. Low country sunrises are pretty special, but I recommend zipping up the tackle bag and catching a few hours of sleep. 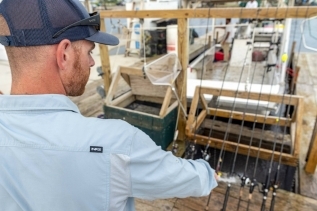 Fishing off the dock at PAC or getting mother-shipped out into the marsh can easily fulfill an entire week in Louisiana, but if you have a rig, spend at least one day away from the Pointe Aux Chenes haven. Lafayette is a little more city-like, with restaurants and bars on every street corner. It’s always bustling with activity. Spend an afternoon here, if you want, but I recommend just passing through on your way to Lake Martin. If you left any gear at home (or the RV), stop at Pack and Paddle. 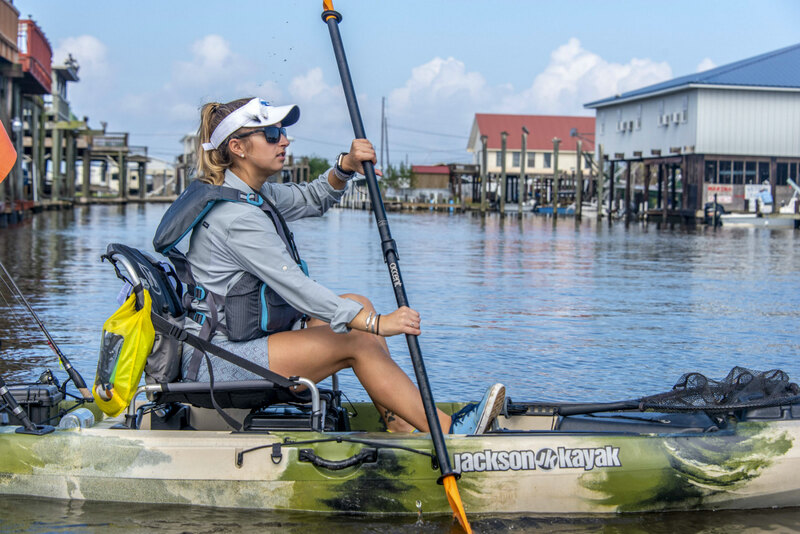 From basic fishing gear to bait necessities, kayaks to fly rods, sunglasses to tents, and backpacks to boots, Pack and Paddle has it all and the staff is friendly. It’s a trusted little shop. Grab a quick bite (and a beer, c’mon it’s vacation) in Lafayette, then drive 15 minutes farther to reach Lake Martin, one of the most beautiful freshwater lakes I’ve ever seen. A bird watcher’s paradise, cranes and heron stalk baitfish. When we rolled up to the launch, the Spanish moss delicately dangling from the branches of the Cypress trees immediately caught my attention. It was the most picturesque moment of Lake Martin—maybe all of Louisiana. We unpacked our gear and pushed the kayaks into the murky water. We paddled through the trees and speckled lily pads out into the vastness of the lake. The atmosphere was so tranquil. And for its sheer beauty, the lack of crowds surprised me. Within the four hours we spent paddling along the lakes edges, we caught a handful of largemouth bass. Cast after cast often left us with strings of lake scum trailing behind our lures. But paddling made it easier to maneuver through the muck and find the perfect crevices filled with fish. Giant tree trunks grew out of the depths of the lake, creating little hideaways for small fish. You can almost predict where they’re hiding between the caves and loops of the roots. But the most memorable moment? When the sunbathing alligators transitioned into the water as we paddled by and lurked beneath us. If you get off the water in time, Blue Dog Cafe is a must for lunch, dinner or just a couple of drinks. The menu is full of traditional low-country fares like Gumbo and Po’boys and a few Cajun dishes with a unique flare like the Crawfish Enchiladas or Blue Crab Spaghetti. Don’t worry, it’s not all spice and seafood. They do offer salads, a basic burger, roasted chicken and steak. Be sure to take note of the unique canvases around the dining room. Inspired by the loup-garou, a werewolf creature from Cajun lore, the late founder of the Blue Dog Café, George Rodrigue, was a famous artist, and his Blue Dog became a pop art icon and lasting legacy. 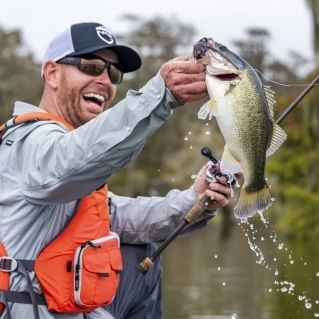 The week I spent fishing in Louisiana changed my perspective on the south—a little. Now, there is The South and there is Louisiana. (I may need to spend more time in other southern states.) But I couldn’t have made it those five days without a few unexpected amenities, of which, I strongly suggest you pack on your next visit to the bayou. Nose plugs. A weird one, huh? 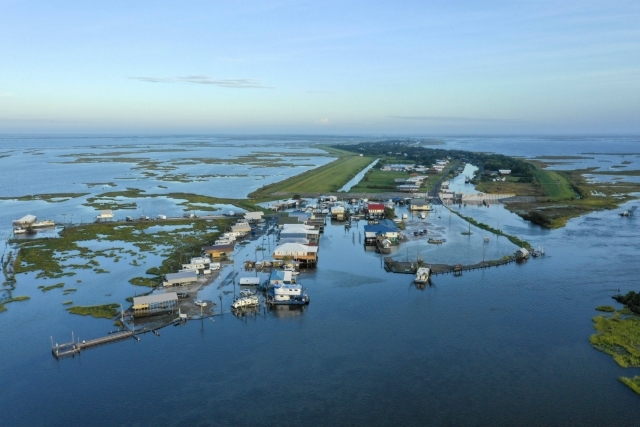 A pipeline runs through the marsh in Pointe Aux Chenes infusing most of the water with sulfur. If you’ve ever been through a sulfur field, you’ll know exactly what I’m talking about. The pungent smell permeates your shower, your teeth-brushing routine, anything that involves water. It lingers on almost everything and makes you feel dirtier than you did before you rinsed off. And another unexpected item: Victoria’s Secret Amber Romance body spray. This will be a lifesaver. Although it does nothing against mosquitos (so definitely bring some regular bug spray and long sleeve shirts) no-see-ums can’t stand the smell. If you’ve never experienced swarms of no-see-ums, you may not understand the level of annoyance they wreak. But the minute bugs fly into your eyes, your ears, your nose, your mouth and they bite. And that bite itches. If you want to be super efficient, invest in the lotion, too. It stays on longer than the body spray and moisturizes your skin all in one. Amber Romance worked so well, I’m tempted to let VS know they’re missing a marketing opportunity. 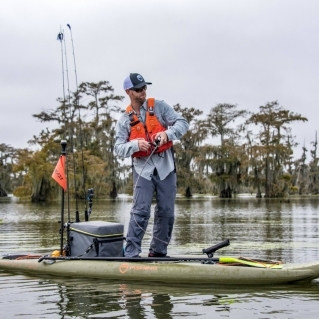 Between listening to music, taking shots of bourbon and playing the spoons until all hours of the night, to the long days chasing redfish in the bayou and being towed in by a skiff that can barely hold four people, my time in Louisiana was a memorable one. Five challenging days. Four new fisherman friends. Three new species caught. Two fishing locations. 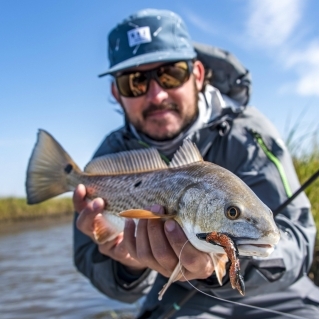 And one amazing new state later, Pointe Aux Chenes is a must-go destination for chasing reds in a kayak. Editor’s Note: Guest contributor Jamie Costa is from a small island in Massachusetts. 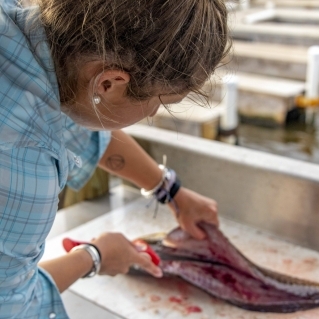 She spent her summers sportfishing for striped bass and bluefish off the coast of Cape Cod on her dad’s custom charter fishing boat. She holds degrees in Journalism and Spanish from Roger Williams University. Check out her website and follow her on Instagram.